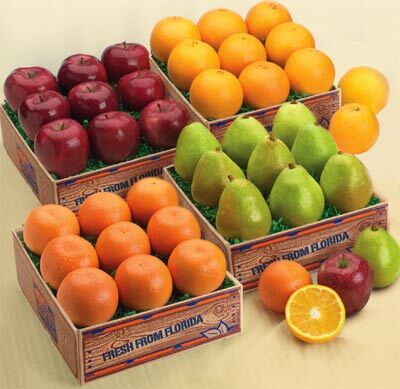 They'll sing with joy when they receive four individual boxes of our best, grove- and orchard-fresh fruit: sweet Florida Navel Oranges, crisp Red Delicious Apples, luxurious D'Anjou Pears and peel-and-eat Florida Tangerines. Not only an extraordinary gift, but a tremendous value. Sign up to be notified when Ultimate Medley is in season. The Ultimate Medley is available November through December to the US and eastern Canada, excluding Arizona, California, Louisiana and Texas due to USDA regulations.